It’d be better for everyone if Andrew Strauss got dropped again. We wouldn’t have to write about him and you wouldn’t have to read about him. Strauss retired out with 104 in the second innings of the warm-up match against a New Zealand Selection XI. Frankly, he shouldn’t have been given the opportunity to justify his place in the England team – Owais Shah should have been extended that courtesy. But having been given the chance and having taken it, Strauss can at least tell himself that he’s earned his place back. It was a good innings considering the scrutiny he’s under, but he needn’t think he’s conquered the nerves that arise from being watched more closely than your team mates. It’s a Test match next and that’s altogether more serious. If he does well, he might be over the hump. If not, he might find that after one forward step, he’s taken ten backwards. You can pee in front of someone, Strauss, but can you urinate under the eyes of the world? Not literally. Please don’t take that literally. No… Trousers on. Trousers on! Perhaps we could divert your attention away from the trouser-removing Strauss and applaud the century for IRB, Heat magazine’s torso of the month? But on a serious note I am assured by those in the know that Cap’n Vaughan never does well in warm-up games, but is a big match player and will therefore score loads in the Test. 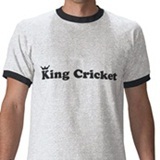 Is this true King Cricket??? Being a Big Match Player often means he doesn’t do very well in tests, either. Michael Vaughan does well in any test Michael Vaughan considers to be a Big Match.